In the mid 1830's William Saunders, a local industrialist, built the carpenter gothic style home on two acres of land at 49 Washington Avenue in Hastings Upon Hudson, New York. Jasper and Maria Cropsey moved to the village, by then renamed as Hastings-on-Hudson, in 1885 and by 1886 had purchased Mr. Saunders' former home. Jasper named the home "Ever Rest," probably reflecting his view of the property as a restful, peaceful place where he and Maria could spend their twilight years together. Ever Rest is partially furnished with selections of furniture from the Cropseys' former home, Aladdin, in Warwick, NY. The dining room set, including table, chairs, and breakfront were designed by Cropsey and built by furniture makers in New York City. Even some of the drapery had been custom made for Aladdin and later altered for use at Ever Rest. Many European and Asian pieces purchased in New York City and Europe accent the decor. In his early 60's, Jasper was still a very active artist, and having been a trained architect, set out to design and build a painting studio at Ever Rest. It was completed in about 1887 and Jasper painted there for the rest of his career. 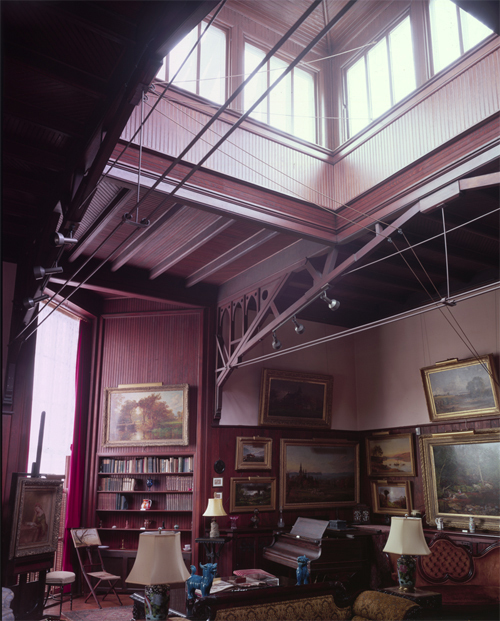 The studio includes a large windowed cupola and full length window facing north, both designed to give the artist as much natural light as possible. In addition to being a working studio, the very large space also served as a family room of sorts, as well as a place to entertain guests. It also features an inglenook fireplace, piano, and various chairs and settees. Ever Rest remained in the Cropsey family after Maria passed away in 1906. Any remaining paintings at Ever Rest were sold at Silo Art Galleries (Cropsey Estate Auction) in New York to settle the Cropsey estate. The Cropsey's granddaughter Isabel grew up in the house and lived the rest of her life there. Her husband, William Steinschneider, was the last family member to live at Ever Rest, passing away in 1970. The home was placed on the National Register of Historic Houses in the early 1970's, and became part of the Newington-Cropsey Foundation in 1977. The paintings on display at Ever Rest are part of the Foundation's permanent collection, collected through the years by John and Barbara Newington, Cropsey's great-granddaughter, and the Newington-Cropsey Foundation. Having been cared for by the Cropsey family and then the Foundation, great care has been taken through the years to maintain the home as it was in Jasper and Maria's time. Please see the tour information page for more on visiting Ever Rest.